From Monday 11 February until Monday 25 March people can read the first draft document and leave their comments online on our consultation website. We are also hitting the road to give as many different communities, organisations and businesses the chance to have their say. The roadshow will give people the chance to talk to the team working on the Plan, find out more about the Plan, what’s in the consultation document and share their thoughts. And as it takes place in half-term week, there will also be a range of family fun activities such as arts and craft, pedal generators, rowing machines and more on offer at each roadshow location. Following the bus tour, there will be five further drop-in exhibitions across the county during the consultation period where the team will again be on hand to help with any queries. You can find out further details about our consultation events – including dates, times and locations – here. 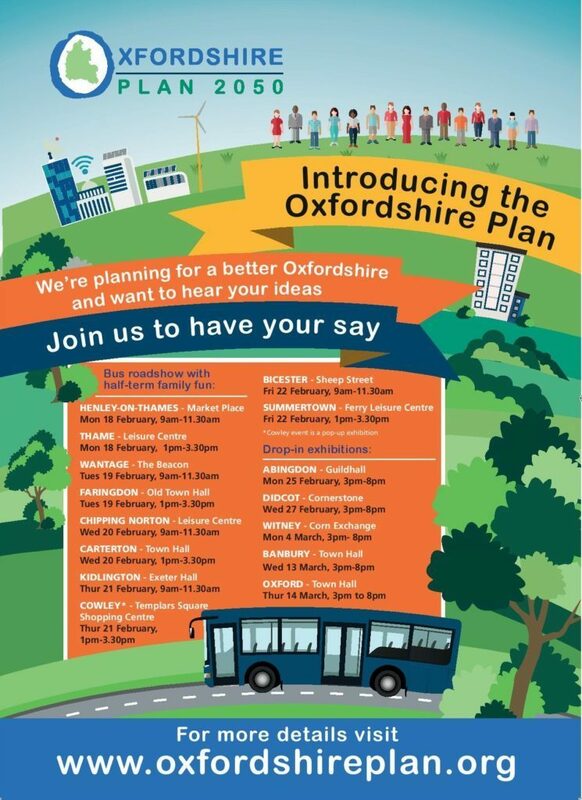 Councillor James Mills, chair of the Oxfordshire Plan Member Sub-Group and Leader of West Oxfordshire District Council, said: “This is the start of the conversation as we begin to think about what we want our county to look like in 2050. The consultation comes after all six Oxfordshire authorities approved the draft document following a series of meetings over the past few weeks. The document was also subject to recommendations from the Oxfordshire Growth Board Scrutiny Panel.